Flash is an interesting theme that is available via the iSpazio source. The stock theme comes with a wallpaper and 42 icons, 19 of which are extra icons that can be labeled (via SSH) as any application you would like. The 19 extra icons actually come in handy since both the Stocks and iTunes icons do not have an icon when the theme is installed stock. Honestly, it took a little bit of work to get this theme to a state in which I thought it looked good. When you install it, there is no icon for Stocks or iTunes. However, because there are 19 extra icons, you can SSH in and pick any of those 19 and easily rename them to Stocks and iTunes. 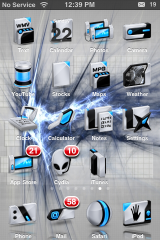 Also, the theme doesn’t comes with a dock so, I turned on the Transparent Dock and the ReflectiveDock in WinterBoard. This made the theme look better. I did go one step further and changed the wallpaper to just a plain black wallpaper so that there wasn’t so much going on in the theme. 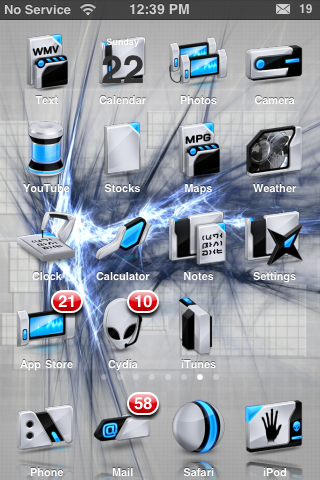 Below are screenshots of the theme stock and what it looks like after a few tweeks. 2. Make sure you have the iSpazio source installed in Cydia. 3. Search for Flash in Cydia, run the install. 4. Open WinterBoard and activate the Flash theme. To much going on for me. Nice post though. I didnt liked it either! It’s too much for me. It should be neat simple and elegant.